My name is Jacquie, live in San Jose and love to stamp! Actually, I also love to garden, cook and write political blogs. Facts about me? Have lived in the Bay Area all my life, went back to school in my 40's (I am still in my 40's, but barely) and graduated with a BS in Public Relations. I work as a Fitness Coach at our local YMCA and love my job. I started this blog because my bookmark folder was getting way too full and hard to organize! Also, I have been just amazed at the quality of the blogs out there already and wanted to get them listed in one place. I love your crafting area! I just have to use my kitchen counter and haul everything up from the basement! Glad you started a blog looking forward to reading it more! Welcome to Sisterhood! Your little corner of the world looks fab to me! I have a whole room, but my problem (?) is that the more room I have, the more stuff I buy to fill it up! Now, is that really a problem???? Ask my husband! Have fun on your excursion...and buy something great! What a well organised crafty area!! Thanks for your kind comments on my cards, which has really cheered me up as I'm feeling a bit low at the moment. Hi, i've tagged you - check my blog for details!!! Welcome to SBS18! 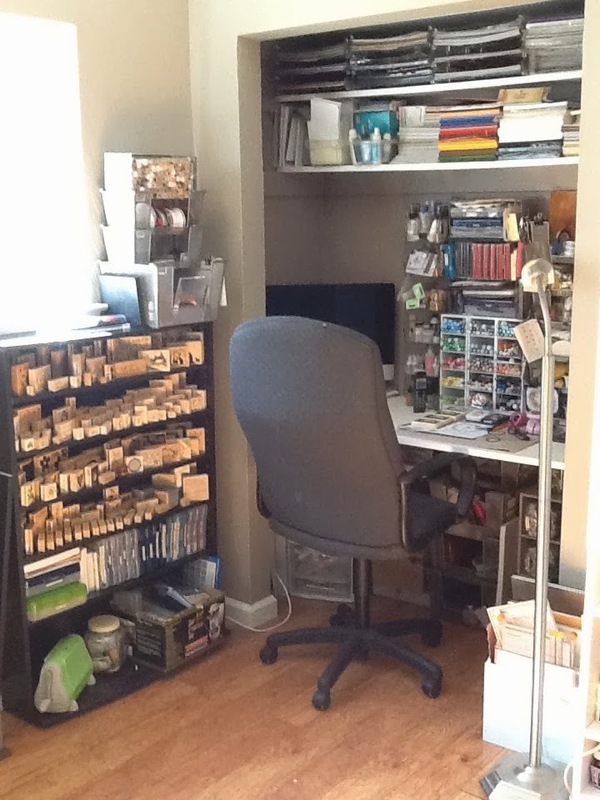 I think you've done a fabulous job of setting up your craft area in a tight space! I have a small room that I share with my husband! I craft while he's on the computer. :)Glad you stopped by my blog. Look forward to reading more on yours! Your crafty area looks fabulous!! Your crafting area is much tidier than mine! I like how organized you have your things.